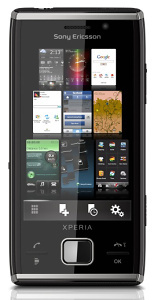 Sony Ericsson finally released the long awaited XPERIA X2. We spotted the WinMo 6.5 powered smartphone online for the hefty price of nearly 500 euro, but the big question remains: Is it worth it? There are many users out there waiting for the XPERIA X2 to finally hit the stores. It missed Christmas by a whisker, but the waiting is over and the Sony Ericsson XPERIA X2 just hit the shelves. The price is no surprise - 490 euro. The XPERIA X2 follows its predecessor's steps and comes with full sliding QWERTY keyboard and a slightly bigger 3.2" TFT touchscreen. The upgrades over the X1 include the 8 megapixel camera and the Windows Mobile 6.5 OS, while the processor, RAM and ROM remain the same. But is this upgrade worth the money, especially when the X1 already got some Windows Mobile 6.5 love through unofficial channels? You can check our first X2 impression here and expect our in-depth review as soon as we get our hands on a retail unit.